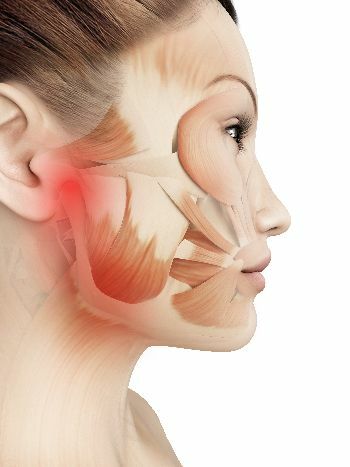 Temporomandibular disorder, shortened to TMJ disorder, is a condition affecting the temporomandibular joint (the jaw) and the surrounding facial muscles. Through a chiropractor, treatment is available to target the source and reduce the effects of this painful disorder. While treatment for TMJ disorder can vary from patient to patient, in many cases, a chiropractor can help by creating a custom treatment plan to help correct the cause of the condition. There are a number of different causes to TMJ disorders and one that is most often overlooked is something that chiropractors treat best, which is a loss of the natural curve of the neck and forward head posture. The improper structure and function or, “biomechanics”, also lead to soft tissue problems that affect the jaw and improper nerve function. Studies have shown that effective TMJ treatment requires postural correction of the head and neck of which chiropractic is uniquely suited for. Traditionally, treatment for TMJ disorders includes pain and anti-inflammatory medication, reducing stress, switching to soft foods and wearing dental splints. Many times these treatments prove to be ineffective or simply used to mask the underlying condition. Dr. Jorgensen’s unique treatment involves several types of therapies including cold laser therapy and myofascial release to deal with the soft tissue dysfunction, reduce pain, inflammation and restore proper neurological control of the jaw. Beyond helping with pain, Dr. Jorgenson will develop a tailored treatment plan to correct forward head posture returning the jaw to normal function correcting the underlying cause of TMJ. This treatment plan can include, regular chiropractic adjustments, posture correction and corrective exercise. Instead of continuing to treat the symptom, let us help you treat the cause. Dr. Jorgensen is a certified posture expert through the American Posture Institute, and has been treating TMJ patients in Fargo for over 30 years. If you suffer from jaw pain or any other symptoms associated with TMJ disorder schedule a consultation with Red River Wellness today.